Shopping in Saks the other day, I was stopped in my tracks by a pair of perfectly printed pants that I just couldn't pass up. The combination of stripes and florals, not to the mention they're silk and wide-legged... could it get any better? Clover Canyon is an awesome brand that I definitely suggest you guys check out. ALSO, how great is this Alexander Wallet my amazing boyfriend gave me for my birthday?! Gotta love guys with style. Those pants are incredible. I love them paired with the flowy white racerback. I absolutely love your pants! 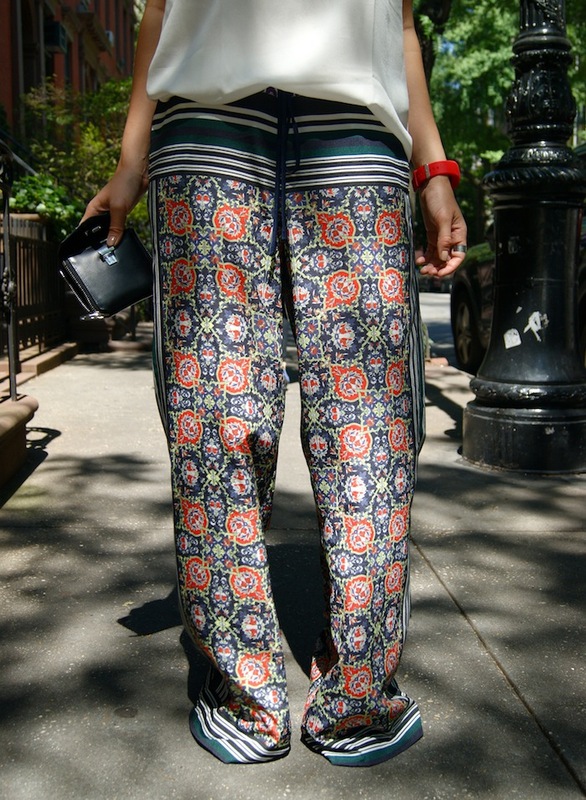 Love those pants, the print is amazing! Whohaaa, i love your pants! Founder & Blogger of WeWoreWhat. A daily lookbook of outfit inspiration from NYC.